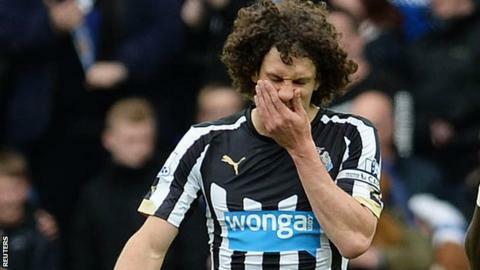 Newcastle United captain Fabricio Coloccini has written an open letter to fans calling for unity as the club battles to stay in the Premier League. The Magpies held crisis talks with manager John Carver earlier this week after losing their last eight league matches - their worst run since 1977. They are now two points above the relegation zone with three games left. "On behalf of the squad we would like to apologise for the moment we are going through," wrote Coloccini. "Players and staff have come together in order to leave all past problems aside and to focus 100% on the three 'cup finals' that we have left. "I would like to make a call to all fans today to also leave aside all differences, all different opinions, anything that divides us as people who love this club." Newcastle host West Brom on Saturday before travelling to QPR on 16 May and then hosting West Ham on 24 May. "The time we have left to turn around this situation is short but after the end of the season we will try to learn from the mistakes we made so that we don't have to go through this again," added Coloccini. "This is as painful for us as it is for you, because when this team comes onto the pitch we do so with the intention of winning and to defend not just the colours of this club, not just our shirt, but also to represent thousands of fans, the whole city." Carver's position came under fresh scrutiny after he accused defender Mike Williamson of deliberately getting himself sent off in Saturday's 3-0 defeat by fellow strugglers Leicester City. However, the club issued a statement insisting he was staying. BBC Sport understands Derby County boss Steve McClaren was asked to take over for the final three games but turned the job down.